On Friday, March 11, Donald Trump stepped onto the stage of the Peabody Opera House, looked over a crowd of some 3,000 spectators, and began his familiar ritual of self-affirmation. “Build that wall,” he murmured into the microphone. In response came the chant, an anthem carried on a swell of boisterous male voices. This is the art of Trump, and for months, he’s made it look remarkably easy. Bewildered pundits ruminate for hours on his seemingly inevitable progress through key battleground states. But at the end of the Friday rally in St. Louis, the unstoppable Trump left the stage a different candidate. 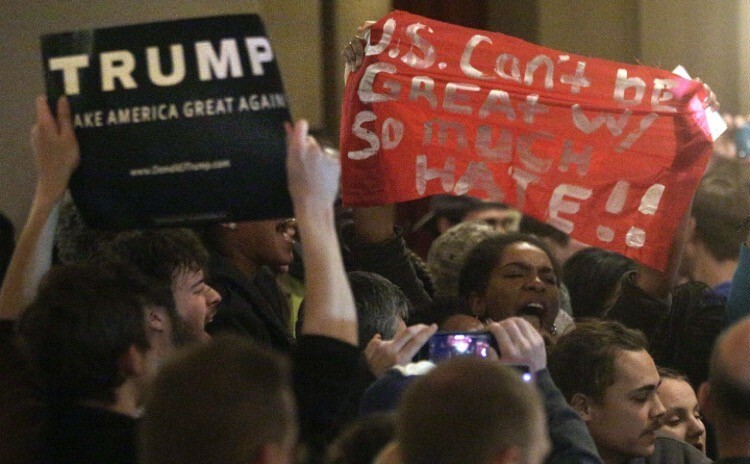 A planned rally in Chicago that night was overwhelmed with protesters and abruptly canceled. On Saturday, during a speech in Dayton, Ohio, security guards enclosed the candidate in protective bear hugs as a protester tried rushing the stage. On Saturday evening, in Kansas City, Trump’s rambling observations on America’s greatness were interrupted by protester opposition more than a dozen times. Something has changed for Trump, and it began Friday on an opera house stage in St. Louis. In St. Louis, Trump finally met the whirlwind. Well before Trump’s campaign announced its March 11 rally, battle-hardened St. Louis protesters were already preparing for his arrival. Missouri’s March 15 primary virtually guaranteed a visit from the reality TV host-turned-politician, and the local protest community wasn’t simply going to stay home while this billionaire buffoon stirred hatred in their city. But Trump’s rally posed a challenge for black activists like Jade Woods. That treatment frequently featured violence. On March 9, two days before the St. Louis rally, a 78-year-old man in a cowboy hat was filmed delivering a blindside elbow to the face of a black protester in Fayetteville, North Carolina. Charges were ultimately filed against John McGraw, but his comments following the incident mirrored Trump’s celebration of patriotic, tough-guy attitude. On Thursday night, one day before Trump’s St. Louis rally, Woods attended several protest planning meetings. 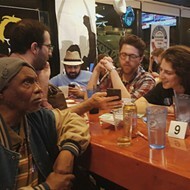 At MoKaBe’s coffeehouse — where protesters sheltered in 2014 as tear gas was deployed along South Grand Boulevard– about a dozen activists gathered to discuss tactics for a demonstration outside the Peabody. From there, Woods and another black college student named Jamila Jackson made their way to a north city church, where they met two experienced white protesters with ideas of their own: Ferguson activist Keith Rose and Colleen Kelly, a Catholic Worker. Kelly and Rose knew of the potential violence that awaited black protesters. They had devised a plan that would place undercover white activists in the crowd to take the brunt of whatever punishment Trump’s supporters dished out. With Woods’ and Jackson’s involvement, those plans were folded into a larger and more audacious strategy. Early Friday morning, Woods and Jackson joined a contingent of 30 undercover protesters waiting in line, which was already curving around 16th Street and onto Clark Avenue at 7:30. The doors didn't open until 9. If asked about their interest in Trump, Woods and Jackson claimed to be curious college students attending the event with their classmates and professor. The white activists also stayed incognito. Rose, dressed in flannel and a camouflage-printed baseball cap, blended easily with the largely white crowd. Along with three white activists, Rose purchased Trump campaign buttons and exchanged sly smiles as they joined chants of “Build that wall!” and “Hillary for prison 2016!” Three hours later, Rose and his team passed through the security checkpoints and entered the Peabody. So far, the plan was moving without a hitch. Rose shepherded his team to a predetermined section in the rear of the auditorium, where they joined two dozen other similarly disguised protesters. Above them, two smaller teams maneuvered to seats on either end of the balcony. When Trump appeared, Rose, Woods and the others raised campaign signs and cheered, “We love you Donald! Build that wall!” Trump took his place behind the podium, waving and winking to the sea of red hats and pumping fists. “I love you too,” Trump cooed. 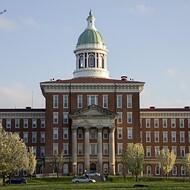 “This doesn't get talked about in the press — the love that's in these rooms. I mean, it's love! You know, they talk about a protest or something; they don't talk about what's really happening in these rooms and these stadiums — they don't talk about the love." According to Woods, the plan called to let Trump speak for 30 minutes. But, as it turns out, there were other protesters in the crowd, unaffiliated with Woods’ group, and they had their own ideas. Five minutes into an anecdote about Hillary Clinton’s overuse of teleprompters, a young black man disrupted Trump and two officers quickly shuffled him out of the auditorium. The crowd jeered. Trump, looking as pleased and orange as ever, joined in on the fun. "Look. You'll notice they're singles,” he said. “There's very few of them, but they're singles. And they go into one location; there will be some at other locations, and they'll scream a little bit and we'll have to stop for a couple of minutes — we'll have a good time. We'll have a good time. So you'll see — you'll find out, they're singles. It's a single here, a single there, it adds up to like four people, but you know, they make a big deal." Minutes later, another lone protester was escorted from the rally to a similar refrain of boos and hoots. Two more protesters would rise from their seats. “Where do your clothes come from?” one shouted, a reference to Trump’s branded clothing manufactured in China. But it was time for the headliner. The two protest teams on the balcony deployed their banners and began chanting, and the ground-floor Trumpeteers craned their necks and mocked what they assumed was another small-scale interruption. In fact, the balcony protesters served as both diversion and countdown. With police and security guards responding to the balcony, Rose and the other white protesters made their move, forming a ring around Woods, Jackson and the black protest team. Woods and Jackson stood up, raising their signs. The red hats turned to face the new source of attention as the protesters launched into a chant of their own. Officers attempting to reach the protest line bottlenecked against dozens of riled-up Trump supporters filming the scene on their smartphones. 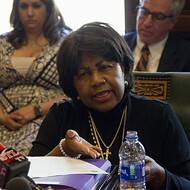 That’s when Rose and others ripped off their disguises – Rose now wore a black t-shirt reading “Race Traitor” – and locked arms around the elbows and waists of their comrades, creating a buffer zone for the black activists in the center. 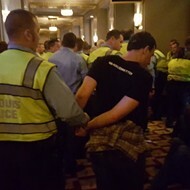 St. Louis metro cops in fluorescent vests seemed unsure what to do. As Trump supporters bellowed “USA! 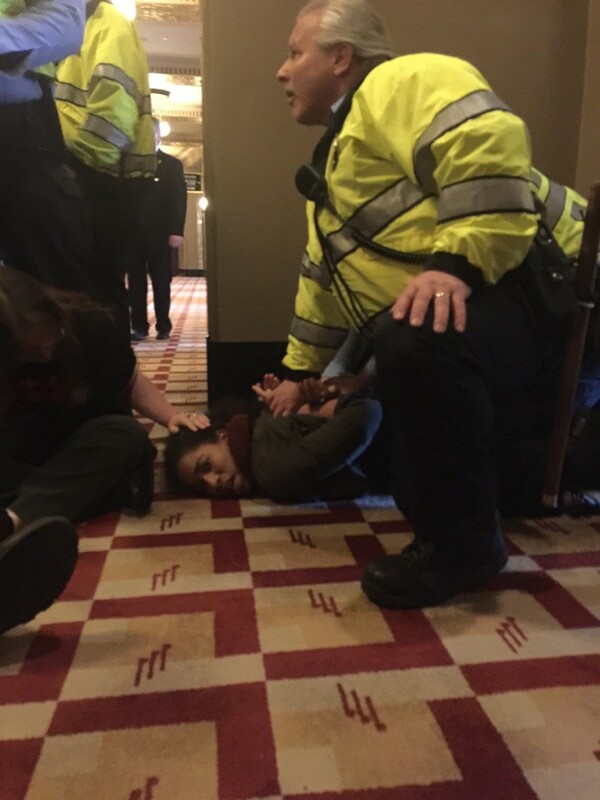 USA,” officers attempting to pry protesters loose found little leverage in the cramped spaces between chairs, protesters and Trump fans. Trump himself seemed to fade to the background, now only a distant voice murmuring “troublemakers” and “get ‘em out” as the scene descended into chaos. One by one, officers peeled the white defenders off the larger body of protesters, yanking arms and pinning necks along the way. The cops struggled to control bodies that went suddenly limp in their hands. It took ten minutes from the start of the protest for Woods and Jackson to be dragged into the aisle and roughly detained. Police arrested some 32 people at Trump's rally. They were transported to central booking and nearly all were released in under two hours. The protesters were charged with disturbance of the peace. And those actions stand as the most successful shutdown of a Trump rally in progress – ever. Later that night, Chicago protesters turned out in such force that Trump, citing security concerns, canceled the rally. Jade Woods (pictured above) says an officer lifted her in a choke-hold while removing her from the auditorium. A few disrupted rallies won’t break Trump’s spell. 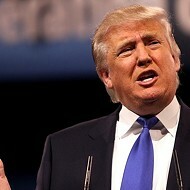 He’s a survivor and capable of talking himself out self-contradictions that would be fatal to other candidates. He is a Republican who can support for Planned Parenthood, wave off campaign contributions to Democrats and fumble through questions about his white supremacist supporters in the KKK. 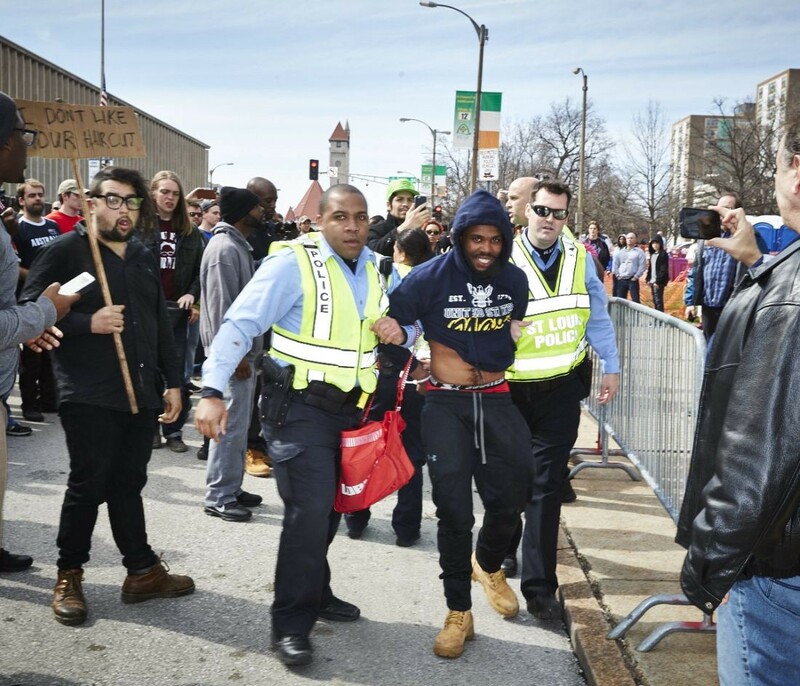 But the coordinated action in St. Louis shows that it’s not just singles – and the people willing to stand up to Trump add up to more than just four, or a dozen, or even two dozen. The Chicago rally was canceled, in part, because of concerns there were as many protesters as supporters. That’s a big change from past rallies. Something is happening. The national media has been focused on Chicago and what happened outside the rally there. But what happened inside the rally in St. Louis is just as telling. For the first time, the unstoppable candidate was stopped in his tracks.